Reading Tony Hsieh quotes about passionate customer service practices is the same as reading a customer service Bible since in many ways Hsieh wrote the book on turning customer service philosophies into sustainable customer service practices. Tony Hsieh is recognized as a passionate customer service expert and legendary retail leader in his role as the CEO of the Internet shopping website, Zappos.com. Hsieh is credited with building an exemplary employee culture that consistently delivers exceptional service experiences to a fanatically loyal customer base. And while every U.S. retail industry leader understands the importance of good customer service, Hsieh is one of the few retail company founders with an unwavering commitment and singular focus on customer service. The Zappos customer service difference happens when Hsieh and his employee team put customer service philosophy into customer service best practices all day, every day without exception to create the exceptional. To read quotes about customer service from Tony Hsieh is to read deceptively simple cutting edge ideas about passionate customer service that can elevate the customer experience of any company with direct customer contact. Read some of the best quotable quotes from Internet business leader and customer service expert Tony Hsieh below. Then click the links at the bottom of the page to get inspired by other successful leaders and retail industry founders on a wide variety of leadership topics. “We asked ourselves what we wanted this company to stand for. We didn't want to just sell shoes. I wasn't even into shoes—but I was passionate about customer service." 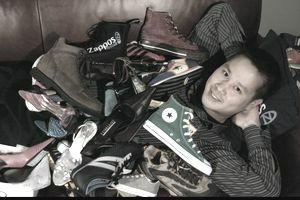 "At Zappos.com, we decided a long time ago that we didn't want our brand to be just about shoes, or clothing, or even online retailing. We decided that we wanted to build our brand to be about the very best customer service and the very best customer experience." "We believe that customer service shouldn't be just a department; it should be the entire company." "At Zappos, our belief is that if you get the culture right, most of the other stuff - like great customer service, or building a great long-term brand, or passionate employees and customers - will happen naturally on its own." "Every employee can affect your company's brand, not just the front-line employees that are paid to talk to your customers." "When people call our call center, our reps don't have scripts, and they don't try to up-sell. They are just judged on whether they go above and beyond for the customer and really deliver a kind of personal service and emotional connection with our customers." "Historically, our number-one growth driver has been from repeat customers and word of mouth." "Hopefully 10 years from now, people won't even realize we started out selling shoes. They will just think about Zappos as a place to get the best customer service."